Thursday, June 7, will be a date I remember for years to come. Why? Because it is the day we saw an amazing, jaw dropping supercell thunderstorm that produced a tornado! We experienced the most exciting adrenaline rush as we chased down this cell, witnessing its rotation, extremely low clouds, and lightning practically overhead! 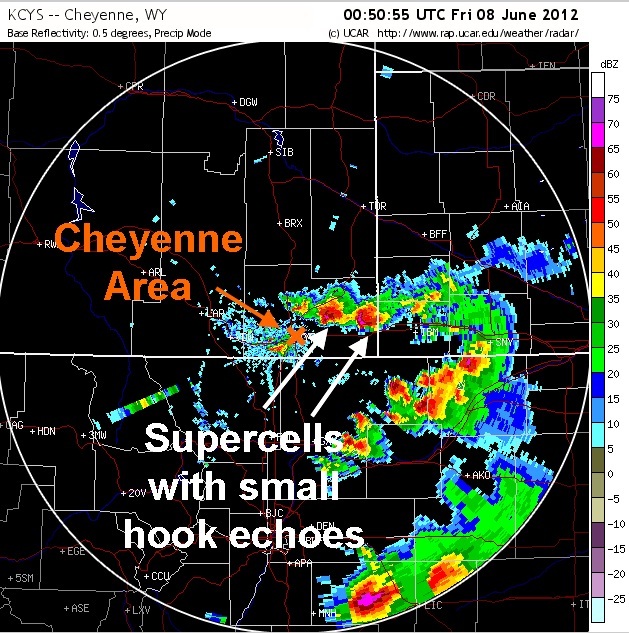 Waking up on June 7, we knew the severe weather threat was favorable for tornadoes in southern Wyoming. After traveling into the state, storms began to fire, and by 3pm, the radar showed two cells we could chase. A less exciting cell was near the small town of Pine Bluffs, WY but an impressive storm that had already spawned a tornado in Wheatland, WY was further north tracking toward Cheyenne, WY. When we reached Pine Bluffs, we had a big decision to make. We could either stay in Pine Bluffs and watch the smaller cell since it had the potential to turn supercellular, or travel further northwest to catch the tornadic cell hoping it would still be strong by the time we arrived. At this point, one person picked up the walkie talkie and said, "We either go big or go home." We all agreed to take the gamble and go for the cell near Cheyenne. This was a large risk because the road network in Wyoming is very sparse, so there was a chance the cell would not be close to any roads; however, luck was on our side and the cell paralleled a highway. When we arrived just north of Cheyenne, we could see the storm over an open field about 25 miles away giving us a perfect view. As soon as we found a safe viewing spot, everyone jumped out of the vans, took out their cameras, and started snapping away as we stared in amazement at the rotating storm. Within ten minutes, we all started yelling "Look at the funnel!!" and we watched a skinny funnel drop out of the storm. 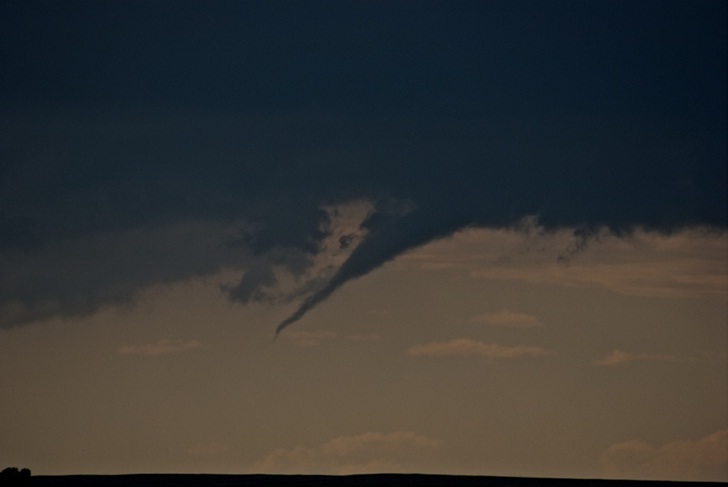 It was difficult to see the funnel cloud reach the ground (which would then make it a tornado) since it was quite small and only lasted for a minute or so. 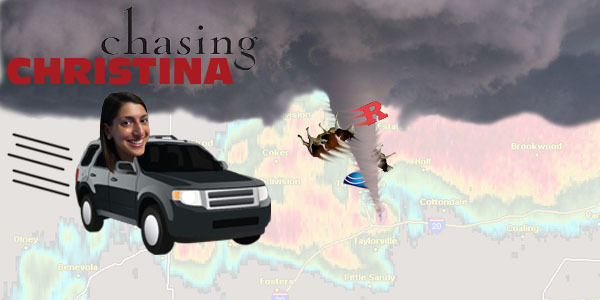 But, according to official reports, it was indeed a tornado. Despite the tornado's short duration, the storm itself lasted for a few hours and was beyond incredible to watch. We could clearly see it rotating counterclockwise and aloft inside the storm, and could see clouds moving in different directions. This experience was amazing and gave me a new found appreciation for those individuals who live in Tornado Alley. No other storm we saw was comparable to this and was definitely the highlight of the trip. Now we are on our way back home to New Jersey, but one thing is for sure - I can officially cross off seeing a tornado on my bucket list!